Check out all the parties going on at the world's largest club. Last year, the sleeping giant woke up. The world's latest club Privilege enjoyed one of its most successful seasons in recent memory. With a similar programme this year, the San Rafael super-club is looking to build on those foundations with another record-breaking season as it celebrates its 25th anniversary. Here's what's in store. While Wednesdays and Saturday remain dormant for the time being, there's no disputing that Privilege has spread its programming wisely over a multitude of genres. Each of the five parties caters to a different audience. A considered approach, we must say. There's techno, popular/electro, urban, underground tech house and even a trance representation. Let's take a look at each party in further detail day-by-day. Launching a trance renaissance and satisfying a large demographic, SHINE is the new party occupying Monday nights in Vista Club. The new project from ex-Creamfields CEO Nick Ferguson and trance heavyweight Paul Van Dyk certainly comes with some serious credentials that other new ventures often lack. 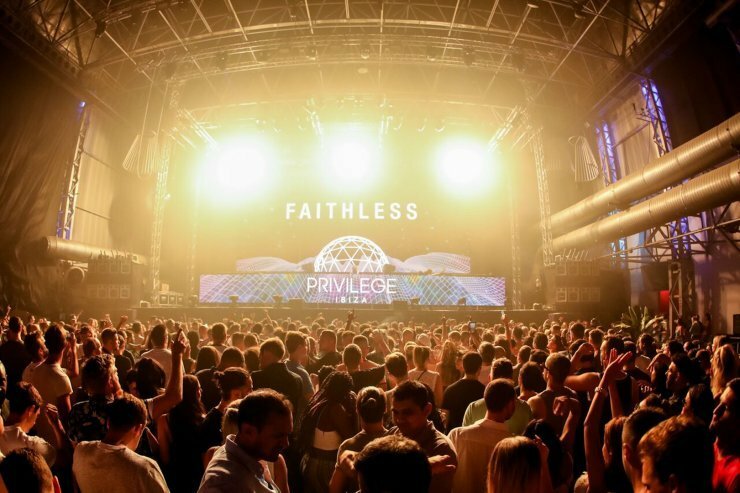 Given how sparse dedicated trance events are in Ibiza 2018, all the signs point to this being very successful. Aside from PvD, other artists playing include Aly & Fila, Cosmic Gate and Jordan Suckley. On Tuesdays, RESISTANCE returns. After a promising debut last summer, Ultra's underground wing comes back with more firepower for a full venue assault. An unrivalled roster includes the likes of Richie Hawtin, Maceo Plex, Joseph Capriati and global ambassador Carl Cox, who plays three massive dates. Last year's mainstays Sasha & John Digweed are back, with three of their five appearances taking place in the Vista Club. After many calls, Adam Beyer's Drumcode finally gets its own Ibiza showcase. RESISTANCE mean business in year two. SuperMartXé returns to its spiritual home, switching to Thursdays after years of looking after Fridays. The brash party brand known for its exuberance, flamboyance and giant stage production will feature a hefty dose of big room house and a gay-heavy crowd. Details of guests DJs will be revealed soon, but the music almost plays second fiddle to the visuals with this party. Acts in previous years have included Steve Angello, Afrojack and Chuckie. After two highly successful years, IAMARICHBITCH no longer represents a surprise package but rather an established part of Privilege's programming. It has earned its spot by drawing a large crowd, consisting of many islanders. Catering to a very large Latin market, it delivers lots of different urban sounds from hip-hop to reggaeton, bashment to R&B. Party host Ale Zuber is the weekly resident. He'll no doubt be joined by guests like Bad Bunny, Big Fish and Juan Cuba. Following a year's hiatus where they experimented with daytime parties, London party collective and record label Solid Grooves return to Vista Club. This time it takes over Sundays, with its core family of PAWSA, Michael Bibi and Dennis Cruz all featuring prominently. Plus there will be some exceptional guest artists throughout the summer, including Riva Starr, James Zabiela and Dense & Pika. Sure to be a favourite amongst locals and the Brit contingent, this will be a Sunday sermon for the groovers. Overall, Privilege is looking really strong. If the super-club does stay closed for two nights of the week, it might actually be an astute move. Often clubs end up making competition for themselves by having parties that are too similar in terms of music and crowd they attract. This accusation cannot be levelled at Privilege. Whether the world's largest nightclub can eclipse the success of 2017 remains to be seen, but all of the pieces are falling into place.